OnlinePassportPhotos is pleased to announce extension of our revolutionary online Passport Photo services for Russian Passport photos. It is difficult to get non-standard size passport photos taken in the USA. Unless you specifically ask for, most stores will print 2x2 inch US Passport photos for you. However with Online Passport photos, you can easily order passport photos for Russian Passport, 8 Passport Photos for $7.95, delivered directly to your home. Note: You can also get them usually within 24 hours by either selecting an option to pick at your local Walgreens store or by asking us to e-mail passport photos in a 4x6 print format that you can take to any photo lab or store and get printed yourself. thank you very much. We got pictures yesterday from Walgreens. They look great. I will recommend you to my friends and will come back soon for more pictures. Russian Passport Photo specs: We see two different specifications. One customer Sergei G has mentioned that the following (Specs #1) are used for Internal Russian Passport and Specs#2 are used for External Russian passport so while ordering, you can mention Internal or External Passport in Special Instructions. 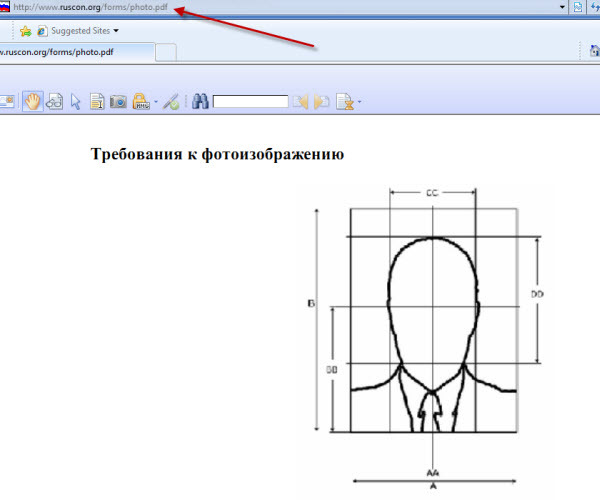 #1) Some of the resources on the Internet list following requirements for Russian Passport photos. They are similar to the Passport photo specifications for European Union but a bit different. Russian Passport photos require 5 mm space between top of head and the top of the photo. #2) Some customers from Russian origin provided us following photo specs. (Please see this attached PDF for details specs). Many customers specifically ask us for these specs so we are by default going to use these specs (specs #2). 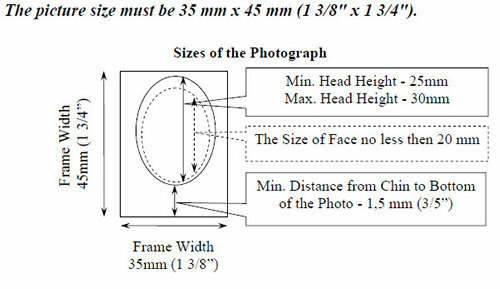 The size of the head, from chin to crown, must be between 25 mm and 30 mm. IMPORTANT: So unless specifically requested to us by clicking on this form which specs to use, we will use Specs#2 above. This company is terrific to work with! I highly recommend it! I needed 3.5 x 4.5 cm passport photos and quickly learned that most photo places in the US are not able to produce this size photos with adherence to all passport photo guidelines. I turned to the web and came across OnlinePassportphoto.com. It seemed too good to be true – take photos at home, upload or e-mail to the company, pay online and get 8 passport photos in 4x6 pic format that can be saved to the flash drive and printed at any photo printing location. I decided to take a chance and had a wonderful experience. First, I had a question on timing as I needed photos in 12 vs. promised 24 hrs. I e-mailed and got an immediate response telling me that I will be able to get photos in 12 hrs. I followed the instructions, submitted the photos and in less than 12 hrs had perfect passport photos that I printed at CVS. I couldn’t believe how easy it was! Not only did I get everything I needed, the responsiveness and commitment to promised results was great! And it is so affordable! We are not able to find authentic detailed Russian Visa photo specifications so your best bet is to refer to your paperwork or visa instructions, or contact the consulate you are applying to and ask for the size. Based on our experience, most foreign consulates in the USA (including Indian consulates in the USA, China consulates in the USA, Mexico consulates etc) accept 2x2 inch photos for visitors. Most probably your consulate may be accepting 2x2 inch photos too. · 35 mm X 45 mm (1 3/8" X 1 3/4") with the head centered in the frame. · The applicant should not look down or to either side, and the face should cover about 50 percent of the photo area. · Side or angled views are NOT accepted. · In general, the applicant's head, including both face and hair, should be shown from the crown of the head to the tip of the chin on top and bottom and from hairline side-to-side. · Sunglasses or other wear which detracts from the face are not acceptable unless required for medical reasons (an eye patch, for example). · Photocopied photographs are NOT accepted. · Glue the one photograph to the application in the designated space (a double-sided adhesive tape could be used). Do not staple photograph. · Do not enclose photographs in glassine or other types of envelopes. 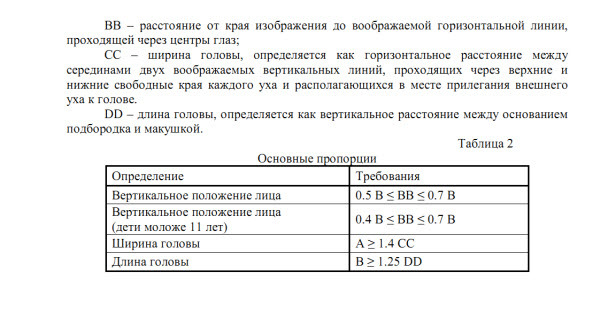 Sorry we can't read Russian language, so if you can download the PDF here and send us detailed specs in English from page 5-6, we would greatly appreciate it. Also, this will also help prospective visitors who want to visit Russia. 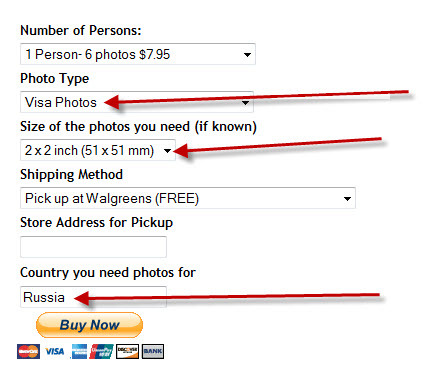 To order Russian Visa Photos, please visit the Payment Page, enter Photo Type as Visa, Size of Photos as 35x45mm or 2x2 inch and Country as Russia. As shown below. Click here for detailed instructions about Passport Photo Specs for Russia. THE CONSULAR DIVISION OF THE EMBASSY OF THE RUSSIAN FEDERATION IN WASHINGTON, D.C. Delaware, District of Columbia, Florida, Georgia, Illinois, Indiana, Kentucky, Maryland, Michigan, Ohio, North Carolina, Tennessee, South Carolina, Virginia and West Virginia. THE CONSULATE GENERAL OF THE RUSSIAN FEDERATION IN NEW YORK Connecticut, Maine, Massachusetts, New Jersey, New Hampshire, New York, Pennsylvania, Rhode Island and Vermont. THE CONSULATE GENERAL OF THE RUSSIAN FEDERATION IN SAN FRANCISCO Arizona, California, Colorado, Hawaii, Nevada, New Mexico, Oregon and Utah. THE CONSULATE GENERAL OF THE RUSSIAN FEDERATION IN SEATTLE Alaska, Idaho, Iowa, Minnesota, Montana, Nebraska, North Dakota, South Dakota, Washington, Wisconsin and Wyoming. THE CONSULATE GENERAL OF THE RUSSIAN FEDERATION IN HOUSTON Alabama, Arkansas, Kansas, Louisiana, Mississippi, Missouri, Oklahoma, Texas. Office hours: Monday – Friday 9:00 a.m.-12:00 p.m. and 2:30 p.m.-5:30 p.m.
Open to public: Visa Desk: Monday – Friday 9:00 am – 12:00pm Passport and Legal Desk: Monday – Friday 2:00 p.m.-5:00 p.m. Jurisdiction: Arizona (AZ), California (CA), Colorado (CO), Hawaii (HI), Nevada (NV), New Mexico (NM), Oregon (OR) and Utah (UT). Office hours: Monday – Friday 9:00 a.m.-12:30 p.m. and 2:30 p.m.-5:00 p.m.
Open to public: Monday – Friday 9:00 a.m.-12:30 p.m. Closed for United States and Russian holidays Head of Jurisdiction: Connecticut (CT), Maine (ME), Massachusetts (MA), New Jersey (NJ), New Hampshire (NH), New York (NY), Pennsylvania (PA), Rhode Island (RI) and Vermont (VT). For latest info on passport photo requirement for Russian Passport or Visa, please click this link.